It was a frustrating but ultimately very encouraging pair of two hour qualifying sessions for Team LNT on Wednesday (June 14) - the rain began falling at the circuit just 40 minutes before track action finally began, this after two and a half days of unbroken 30 degree-plus sunshine. Session One saw Lawrence Tomlinson take to the track first on a surface which was 50% damp and 50% almost bone dry. One out lap and then pit, to check the car over: with new rubber, new suspension and a brand new engine, the professional and conservative approach was the only way. No sooner had Tomlinson left the pits again though than the skies opened with a vengeance, Lawrence tiptoeing back around to pit, his slicks very much not the tyre of choice in rapidly worsening conditions. The team then got down to some serious work, cycling all three drivers but pitting at regular intervals to check the car over, particular attention being focused on the engine, Alan Mugglestone and his team scoping the cylinders to check for any sign of the woes which had afflicted the car during the test weekend. “Absolutely no problem at all,” said a clearly delighted Mugglestone post session. In fact the only issue of any sort whatsoever was what proved to be a diff sensor failure, immediate examination of the diff temperature showing clearly that the dashboard warning was false. With the rain easing off at the start of the second session (beginning at 22.00) there was a change of plan. The team had initially planned to simply cycle all three drivers through their compulsory three laps in darkness, but the improved conditions meant that they opted to continue with some extra night running. Tom Kimber Smith: “Lawrence and Richard finished their three laps each and when I got out there Alan said that if I was comfortable with the conditions I should do an extra couple. Our race strategy at the moment should see Richard and I covering most of the night hours, so that makes absolute sense. The net result of the team’s four hours of effort? 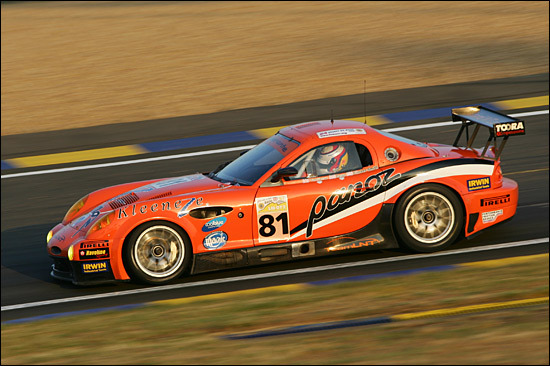 A Panoz Esperante in good shape and a competitive lap time on the timing sheets. With the rain looking likely to stay away on Thursday evening for the second (and final) pair of qualifying sessions it will be time to finally show the true pace available from the #81 Esperante – England (Yorkshire and Georgia) Expects. 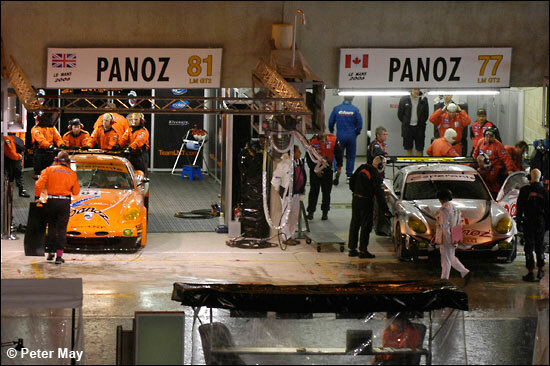 Part of the frustration of a world class endurance event is that the action takes place over several days. Those days can bring a distinct change in the prevailing weather conditions and, if the name of the game is to set the best time, any heroics during a wet session, to gain the qualifying bragging rights, can be wiped out at a stroke by a fair weather day following immediately afterwards. That was the picture at Le Mans on Thursday, with a completely dry circuit meaning that each and every car would almost inevitably leave their Wednesday qualifying time gasping in the dust. 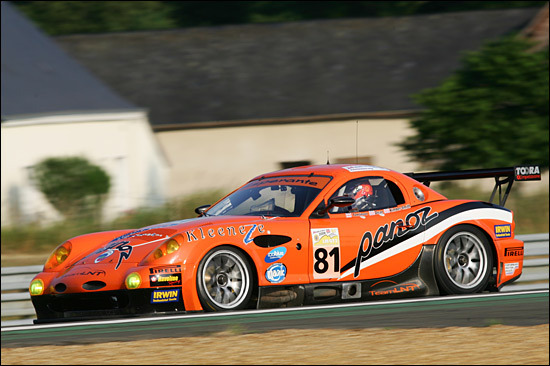 Le Mans is a unique circuit, a phenomenon: the majority of the circuit is composed of roads normally open to the public and the result of this unique configuration is that a lap consists of both smooth and well prepared race track and bumpy, slightly rutted and dusty, public road. 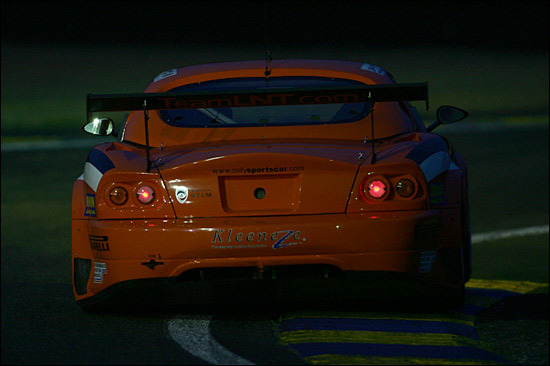 The problem for Team LNT is that they had already had their fair share of bad luck for the Le Mans fortnight. Track time is precious here and whilst four hours of qualifying sessions sounds like an awfully long time on track, there is a vast job list to get through: set the time, get all three drivers through their night time laps, find a race pace and a set-up for the car which works best for all three drivers. Sounds simple, but it all takes time. Despite this assessment, Team LNT’s trio made good progress, the car had no real problems at all in the four hours of running and, as the temperature dropped, the times began to improve. 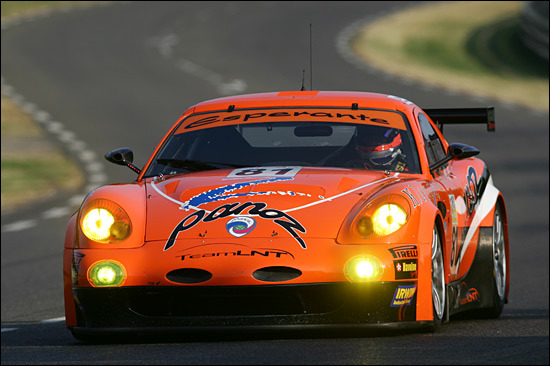 Again the team ensured that all three drivers got ample opportunity to try out the latest batches of adjustments, made to set the Panoz up for 24 hours of hard, fast racing. “Lawrence went out first, then Tom and finally me,” said Richard as the team packed away their gear after the final session ended at midnight. 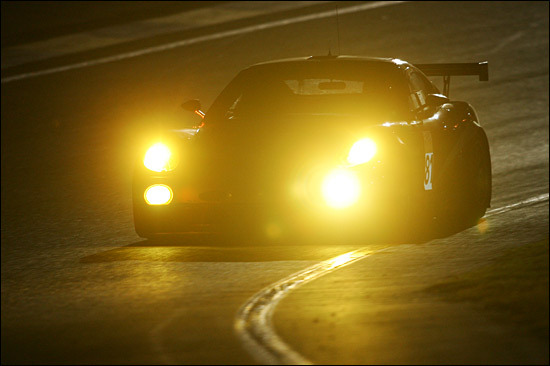 “For the night session I went out first, then Tom and finally Lawrence. 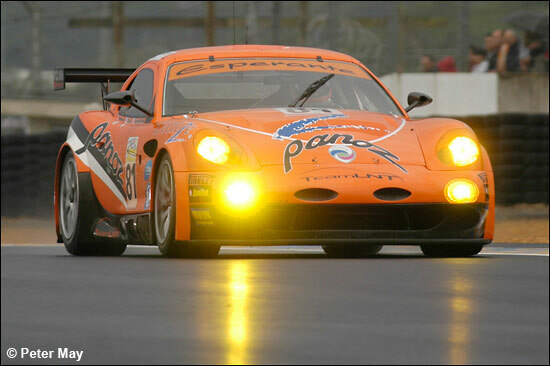 The ultimate result of all their endeavours was a time of 4:12.043, Richard Dean setting a time good enough for tenth in a world class GT2 class, a lap that equates to an average speed of almost 195 km/h over the full lap. “As soon as we went to go for it we knew we were still playing catch up. What we can say is that it’s a race pace, there were no prizes for winning today,” said Richard. 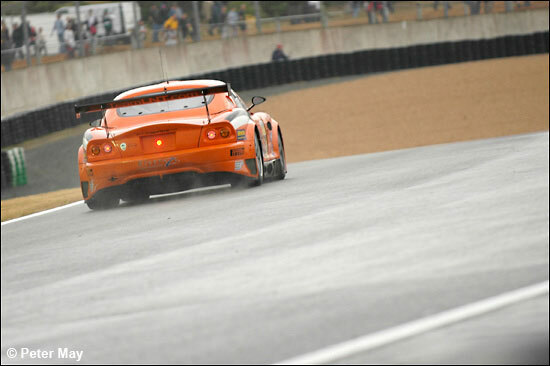 That means that the team had made a substantial move forward in bridging the gap of track time lost. 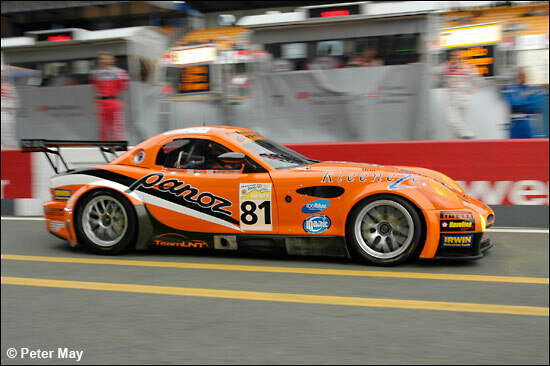 The team had run consistently during the evening at the level they expect to run at during Saturday’s race and, if the team LNT boys have learnt anything so far in their international racing campaign with the Panoz Esperante, they’ve learnt that a fast and consistent pace, with no problems, is the way to make an impact and, if at all possible and racing luck is on their side, finish well up the order.